Chef Roro shares his healthy Fajita Chickpea Taco recipe. Spice up your next Taco Tuesday with this healthy alternative that's also vegetarian. 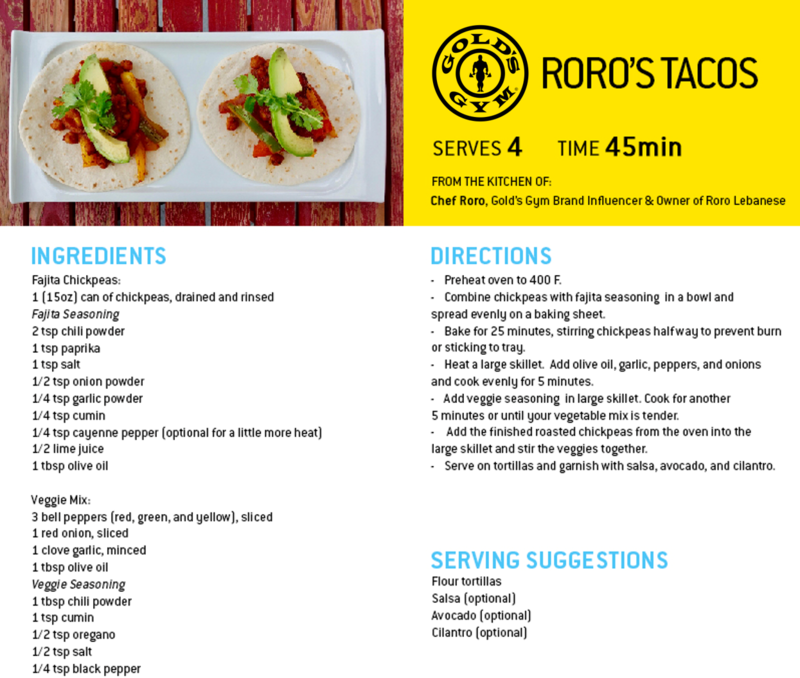 Chef Roro, Gold’s Gym Brand Ambassador and Owner of Roro’s Lebanese in Washington, D.C shares his healthy Fajita Chickpea Taco recipe. Learn how to make Roro’s Tacos, which combine fajita seasoning with chickpeas and vegetables that serve as a healthy alternative to tacos. Combine chickpeas with fajita seasoning in a bowl and spread evenly on a baking sheet. Bake for 25 minutes, stirring chickpeas halfway to prevent burn or sticking to the tray. Heat a large skillet. Add olive oil, garlic, peppers and onions and cook evenly for 5 minutes. Add veggie seasoning in large skillet. Cook for another 5 minutes or until your vegetable mix is tender. Add the finished roasted chickpeas from the oven into the large skillet and stir the veggies together. Serve on tortilla and garnish with salsa, avocado and cilantro.